It shouts and sings with life...explodes with love! It is best known for being the final, haunting, fully-completed film for two major screen legends: 59 year old Clark Gable (once "The King of Hollywood") and 35 year old Marilyn Monroe. 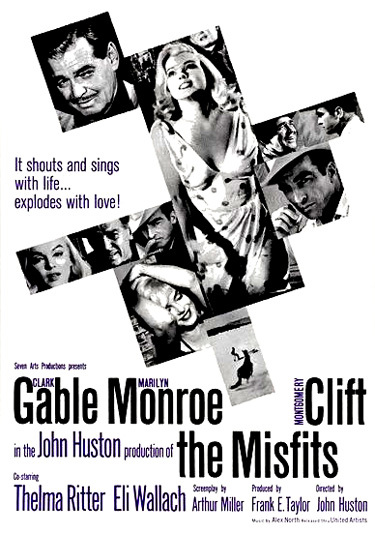 A film retrospective was made by director Gail Levin over 40 years later, titled Making the Misfits (2002), featuring interviews with Arthur Miller and star Eli Wallach and archival photographs. The minor classic film concerns a troubled ex-stripper and divorcee Roslyn Taber (Marilyn Monroe) in Reno, Nevada for a quickie divorce. With difficulty, she practices her lines to a divorce judge with her experienced, wisecracking landlady Isabelle Steers (Thelma Ritter), to rid herself of husband Raymond (Kevin McCarthy). Through Isabelle, she is introduced first to ex-mechanic, former WWII pilot, and widower Guido Racanelli (Eli Wallach) and then in a local bar to aging, washed-out 'real-life' cowboy Gay Langland (Clark Gable), a rugged individualist. The trio of men -- Langland, Guido, and reckless, worn-out, injured 'rodeo cowboy' rider Perce Howland (Montgomery Clift) -- team up to go after a herd of wild horses in the desert highlands for a last roundup, and they take Roslyn along. After Guido's small airplane guides and terrorizes the animals down from the hills, the others lasso and roundup the 'misfit' horses from a speeding pick-up truck. Don't want nobody makin' up my mind for me, that's all. Damn 'em all! They changed it, changed it all around. Smeared it all over with blood. I'm finished with it. It's, it's like, like ropin' a dream now. I just gotta find another way to be alive, that's all. If there is one anymore. (He stands). Perce, cut that mare loose for me, will ya? Roslyn: Gay, if there could be one person in the world, a child who could be brave from the beginning - I was scared to when you asked me, but I'm not so much now. Are you? Roslyn: How do you find your way back in the dark? Langland: (nodding to the nighttime sky) Just head for that big star straight on. The highway's under it - it'll take us right home.